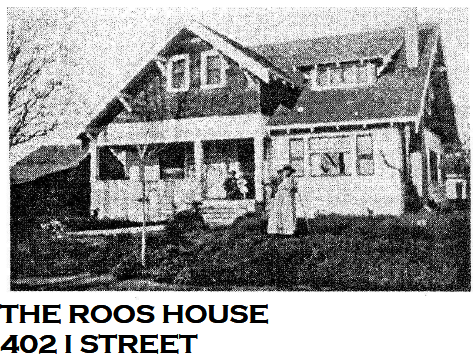 The Roos family, Frederick Carl Roos and Adelia Gertrude Denzler, built three houses at 402 I. The first Roos house burned down in the late 1800s, and a cyclone in the winter of 1914 to 1915 badly damaged their second home. Their final house on the property, shown above, was built in 1915. Frederick Carl Roos was a native of Germany who settled in Davisville around 1863. After engaging in the ranching business for several years in Yolo County, he moved to Davisville and bought six lots (this and five adjacent). In 1873, he married Adelia Gerturde Denzler, a native of Amador County, daughter of Adam Denzler, a pioneer music teacher in Woodland. Frederick Roos was reportedly in the bakery business. Ferderick and Adelia Roos had nine children. One of their children, Charles Phillip Roos married Myrtle Estelle Fritts on October 3, 1913. They built the house located two doors away, at 418 I Street. Charles P. and Myrtle Estelle Roos had one daughter, Phyllis. Phyllis Estelle married Carl Junior Penn in November 17, 1947. They lived with her parents until the house at 414 I Street was built in 1950. Phyllis Penn lived on this block of Davis for over eighty years, until her death in 2004. She is pictured in this photo, standing next to her Grandfather Roos, on the porch of this house in approximately 1922. Her Grandmother Roos is in the foreground. The Roos’s lived in the house until their deaths, Frederick in 1922 and Adelia in 1936. The Roos house is a one and half story Craftsman house featuring gabled roofs with prominent braces. There is large shed dormer in the front and back of the house. The first and second floors are differentiated by changes in the texture of their wooden sheathing: the upper floor is shingled, the lower is clapboarded. There is a large front porch with a solid parapet railing. What has happened since the Roos family lived here? The house was bought by the Carlls in 1936, when Mr. Carll became the Southern Pacific agent after Mr Brinley. They lived in the house for many years. In the early 1970s, the house became a part of a mental health institution. For the next twenty years, adults, then teenagers, lived here as a part of their therapy. The second floor entrance, located on the north side of the house, was added as a fire escape. In 1995, the house was bought by Marilyn Underwood and Mara Johnson who made renovations until they moved in.